Happy Mother’s Day mom and Suzy! This was on the ground right beneath the nest. Boy, even homeless people look at you weird when you are taking pictures of dead things on the ground. Anyway. The legs were about 8cm in length and black. 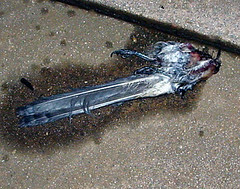 The body was slender and about the size of a scrub jay (well, what was left). The tail was 24cm long, gray with dark bands at the end. The plumage seemed to be gray with white down. ~ by Steph on May 14, 2006.